It’s frankly incredible how often people put in charge of important ventures within the sphere of craft beer manage to undo themselves by letting their innate misogyny float to the surface. We’ve written before about the historical stance of the beer industry against women, and the need for vigilance in standing up to overtly sexualized advertising, but today a story comes to us out of Ohio that pretty much takes the cake. It’s an incredible illustration of just how easily an organization can be dismantled by a single thoughtless, pointless, sexist meme in the social media age. That organization was Northeast Ohio’s Passport Brew Tour, and I say “was” because they don’t even seem to be on Facebook any more—three days after the controversy began, the tour no longer even exists. The inaugural Passport Brew Tour was meant to partner with 20 breweries that had signed on as a craft beer trail, as organized by Akron’s Lunar Cow Publishing. The organization would have facilitated tours to the participating breweries and drummed up good PR for the area as a beer region. At least that was the idea. 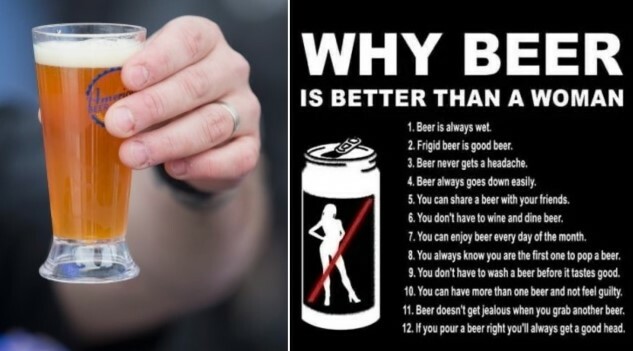 Then came Sunday, when Lunar Cow published a meme to the Passport Brew Tour Facebook page, entitled “12 reasons why beer is better than women.” The post has since been deleted but you can find it easily online, and it contains such gems as “you always know you are the first one to pop a beer,” and “frigid beer is good beer.” Ah yes, those old men’s room witticisms. Unsurprisingly, the response was a swift and unequivocal outpouring of derision for the organizers, to have published something so blatantly sexist in advertisement of a tour where half the participants were likely to be women. Within 24 hours, almost every one of the breweries involved had publicly announced that they wouldn’t be participating in the tour, and essentially distanced themselves as far from the Passport Brew Tour as they humanly could. Here are just a few, but the comments from the female owner of Jen’s Place in Massillon, OH pretty much sum things up with a bow. Lunar Cow, meanwhile, decided that the best way to deal with the situation would be a middling apology posted Monday morning, followed by the posting of a few “women in craft brewing” articles on the page, as if that would somehow dilute the previous misogyny. When it became clear this wasn’t working, the group then switched tactics and blamed the meme in its entirety on “an independent advertising company” that they said they had hired to promote the event, and had now fired as a result. Suffice to say, the internet did not take kindly to Lunar Cow attempting to wash their hands of any responsibility in the whole kerfuffle. Everything has now been deleted, but of course, this being the internet, nothing is ever truly gone, now is it? Beer has changed. It has become a more egalitarian place, but the only way it can keep moving in the right direction is if people and promoters like the ones seen above are rightly not tolerated when they do something so stupid and sexist. Let’s hope that at least a few people learn a lesson from what happened here.